Sreya Atluri is a senior at Thomas Jefferson High School for Science and Technology, located in Alexandria, VA. Pasionate about making a difference in the community, she currently serves as the CEO and Founder of Creating Awareness in Research and Education and an Executive Director for Growth and Inspiration through Volunteering and Education, both non-profits. 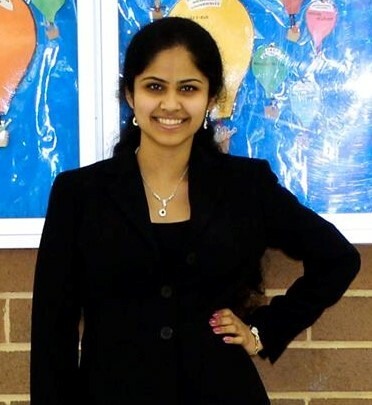 Outside of school, Sreya is dedicated to STEM, serving as a Fairfax County Coordinator for the USA Science and Engineering Festival and an X-STEM Coordinator. She is also heavily involved as a leader in clubs such as Model United Nations, Bioengineering Projects for the Future, and Tomorrow’s Women in Science and Technology, and a BigSibs (mentoring program) Coordinator. In addition, she actively seeks to make an impact in the community through her role as an elected representative of her school on the Fairfax County Public Schools Superintendent’s Student Advisory Council, her work on the FCPS Student Human Rights Commission, and her presentations at STEM and leadership conferences. She also enjoys dancing Kathak (a traditional Indian dance) as well as singing, both of which she has been involved in for 12 years. Sreya Atluri: I am a senior at Thomas Jefferson High School for Science and Technology, located in Alexandria, VA. I currently serve as the CEO and Founder of Creating Awareness in Research and Education and an Executive Director for Growth and Inspiration through Volunteering and Education, both non-profits, because I really enjoy making a difference in the community. Outside of school, I’m dedicated to STEM, serving as a Fairfax County Coordinator for theUSA Science and Engineering Festival, an X-STEM Coordinator, and actively pursuing research opportunities outside of school. I plan to pursue a career in the field of biomedical sciences and bioengineering, where I would be able to combine my passion for science and mathematics with my fascination and knowledge of technology to a fast-growing field, thereby making a positive difference for the future generations. Within my career, I want to integrate giving back to the communityand making an impact on society, through my dedication and commitment to leadership and volunteering for the benefit of others. I am the Secretary-General, or President, of my school’s Model United Nations team, and due to my performance at both national and international conferences, I have been invited to the All-American Model United Team represent the United States of America in Beijing, China for the WEMUN Expo in both 2013 and 2014. Through my experience with Model United Nations over four years, I have become very interested in International Relations across the globe, and want to continue making an impact globally throughout my career. I am the Co-President of Bioengineering Projects for the Future, on the Advisory Board for Tomorrow’s Women in Science and Technology, and a school-wide Coordinator for a mentoring program called BigSibs. I am also involved with STEMbassadors, the Spanish Honor Society, and the National Honor Society. I have pursued my research interests through my internship at the National Institutes of Health in Bethesda, Maryland, one of the world’s foremost medical research centers, for the last two years. I am also a trained Kathak dancer and Carnatic music singer (both Indian types of art), performing at different charity showcases and prestigious competitions. In addition, I believe in a strong sense of commitment to the community, and actively seek to make an impact through my role as an elected representative of my school on the Fairfax County Public Schools Superintendent’s Student Advisory Council, my work on the FCPS Student Human Rights Commission, and my presentations at STEM and leadership conferences. Women LEAD: You are the Executive Director of GIVE, a youth-led community organization that promotes civic engagement, service learning and youth leadership. Can you tell us more about your involvement with GIVE? Sreya Atluri: Absolutely! GIVE benefits thousands of elementary and middle school students in Northern Virginia by providing them with free tutoring and mentoring for individual development. In addition, underprivileged high school students are able to seek AP/SAT preparation materials through the annual book drive hosted by GIVE, so that they are offered equitable chances of preparing for college. GIVE hosts a “RecQuest” summer program supporting STEM, and encouraging students to explore their fascination with STEM through interesting presentations by notable speakers, demonstrations of real-life applications, and hands-on experiments. Moreover, GIVE has published a children’s book advocating the campaign against bullying, and emphasizing the importance of diversity. I have been heavily involved in all components of GIVE, and have specifically worked to expand the tutoring program to multiple new centers this year and incorporate STEM components into GIVE’s curriculum. I have also overseen the logistics for the AP/SAT book drive and promoted the awareness of the RecQuest program. I currently am the leader of the Development Committee, comprised of the Public Relations and Fundraising committees. As such, I work on coordinating partnerships to further enhance and publicize GIVE’s mission and impact, expanding GIVE’s presence on social media and online communities, and organizing fundraisers to support the ongoing projects. In addition, my involvement in GIVE has sparked an interest to make a difference in the international community, and as such, I am the CEO and Founder of ‘Creating Awareness in Research and Education’ (CARE), a non-profit aiming to spread awareness of the importance of STEM and education, and seeking to spread appropriate resources in both the local and international communities, especially in areas where such opportunities are not readily available. Based on my rich and diverse experience and fascination with STEM, I feel that it is important to share my knowledge and provide the rising generation with equal resources, which drove the creation of CARE and its mission. On the local scale, CARE has organized and sponsored a Winter Jackets program at elementary schools, where students were given new winter coats to prepare for the season’s weather, especially important given the record statistics for this year’s season. It is now expanding across multiple states in USA. In addition, I have explored the expansion of CARE’s mission on an international scale, funding merit scholarships in rural areas of India. CARE is involved in providing free dictionaries, curriculum books, and other educational resources to middle and high schools in a variety of rural districts (counties) in India. The mission is to promote and inspire learning, and provide opportunities for students to escape the cycle of poverty by joining the international educational community, and then inspire them to give back to their local communities, setting up a cycle of sustainability and community empowerment. The scholarships are intended to motivate student learning and achievement, and recognize those who put in an effort to better themselves. Women LEAD: Can you tell us more about your involvement with initiatives in STEM (Science, Technology, Engineering and Mathematics)? In this capacity, I work to ensure that the greater community is kept aware of the opportunities provided by the USA Science & Engineering Festival, through coordinating publicity events, speaking to the school board to make sure schools in the county are aware of the opportunities, planning and organizing meetings for the Volunteer Outreach Team to determine an effective plan of action, being involved in the creation and distribution of promotional materials, actively participating in conference calls for planning purposes as well as expanding our network of partners and sponsors, and organizing the ultimate event- the USA Science and Engineering Festival Grande Finale Expo. In addition, with my involvement, I serve as a program director for the Extreme STEM (X-STEM) program, sponsored by the USA Science and Engineering Festival to promote the X-STEM Symposium, and to encourage students to be engaged in and promote STEM. As a coordinator, I recruit delegates from my school and certify that they have completed tasks to earn free program tickets. As a member of Tomorrow’s Women in Science and Technology, my team and I annually host Techstravaganza, a free event open to the public designed to encourage students to become involved through real-life demonstrations of applications, hands-on science experiments, exciting exhibits, and interesting speeches. I am currently on the Children’s Science Center Volunteer Committee. As such, I promote awareness of Children’s Science Center events in the greater community, and work towards ensuring that children having access to the opportunities offered. I also coordinate efforts to recruit volunteers through publicizing and promoting awareness at my school and through the other organizations I am involved in. I also volunteer as a presenter at monthly mini-labs conducted at elementary schools design to inspire interest in STEM and promoting its mission, and have contributed to the “Museum Without Walls” project, a virtual museum which travels around Virginia to give students the opportunity to see creative and unique innovations being applied in a real-life setting. With my involvement in the Bioengineering Projects for the Future club at my school (currently serving as Co-President), I led an effort to create a functioning emotional stress detector, based on the inverse relationship between skin resistance and stress. After showcasing the stress detector at Techstravaganza, the event mentioned above, we donated the stress detector to the Children’s Science Center to allow more children to enjoy and learn from the project. I am passionate about presenting at STEM and leadership conferences to further spread the message about STEM and the potential of its impact. Women LEAD: Why does advocating for women in STEM matter to you? Sreya Atluri: Advocating for women in STEM has been a huge part of my life, as the disciplines involved in STEM hold the potential to truly change the world, and make a valuable impact in the community. Women should be encouraged to pursue their dreams, and not let their fears of being the minority hold them back. As a winner of the National Center for Women & Information Technology (NCWIT) Award for Aspirations in Computing VA/DC Affiliate in 2014, as well as a National Runner-Up for the National Center for Women & Information Technology (NCWIT) Award for Aspirations in Computing, I have been fortunate to be involved with a community in spreading the importance of STEM and empowering women, and this is something I hope to do throughout my future endeavors. It matters simply because there is a discrepancy in the statistics of women choosing to pursue STEM careers, and given that, it is absolutely essential that women are encouraged to develop a love for STEM, and not hold back because they are afraid of being among very few women in that respective discipline. I have been fortunate to be able to pursue my dreams, and I hope to work towards a future where all women will have the opportunity to pursue theirs. Sreya Atluri: My mother! My mom has been my rock and my support for the last 17 years, and I could not imagine my life without her. Anything I need, at any time of day, I know that she will be there for me. I sincerely appreciate how my mother supports me in all of my endeavors, allowing me the freedom to explore my own passions while lending invaluable strength and support. She has taught me the importance of expressing my opinions and upholding my beliefs, along with a strong commitment to giving back to the community and making a difference in the world. With her encouragement, I have been fortunate to always pursue my dreams, and know that no matter what happens, my mother will be there for me. I know that I can truly count on my mother for anything in my life, and without her, I certainly would not be the women I am today. My mother is my role model and one of my best friends, and undoubtedly the woman who has had the greatest impact on my life. Sreya Atluri: Pursue your dreams and do not let anything hold you back! Stand up for what you believe in and choose the impact you seek to make. If you are truly passionate and driven about something, you will have the opportunity to succeed and you will gain from the experience. Follow your dreams and work towards making them a reality.